One question has bothered many of us for a long time: Why do some companies make billions and some fail miserably? The market has changed. 20 years ago, brands were pushing customers into buying their products. They sent out direct mail, made cold (and quite annoying) sales calls and, basically, did everything in their power to “force” you to become a customer. Back then, people had no other option. Everybody was doing it. Because it used to work. Used to. I don’t want to throw around buzzwords like “Web 2.0” or “Web 3.0” (whatever this might be). One thing I know for sure is that the market has developed further than 1.0. Nowadays, brands are no longer pushing you. Instead, brands do everything to make you want to become a customer (pulling instead of pushing). Look at what’s happening right now: Brands have communities. Brands have loyal fans. And, most of all, brands have platforms and whole ecosystems. Think of three big technology companies. Chances are that you thought of companies like Google, Apple and Facebook. Now what do they all have in common? All of them have an open ecosystem. What I mean is that all of the above mentioned companies have opened their doors to third parties, allowing them to create products and/or services around the platform. Let’s have a quick look at how Facebook has grown over the last 9 years. 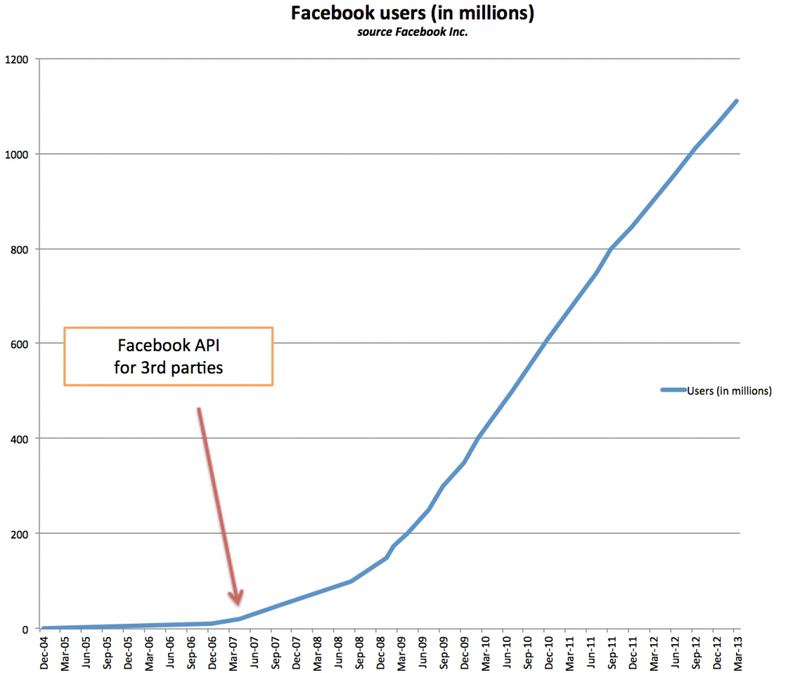 On the graph below you can see that Facebook did something that led to an explosive growth of the number of users. In May 2007, Facebook has introduced “Facebook Platform”, an API which allows other companies to use Facebook’s data and build services around it. This changed everything. Suddenly, other companies started to arise whose main source of income was Facebook. Zynga (the maker of FarmVille) was founded in July 2007, just two months after the introduction of the new Facebook API. Coincidence? Definitely not. What Facebook did was probably the smartest move in its history. They have helped other companies to benefit from Facebook’s platform, which led to a huge increase of Facebook users. It’s a win-win situation for everybody. Now let’s take Apple (always a good example). 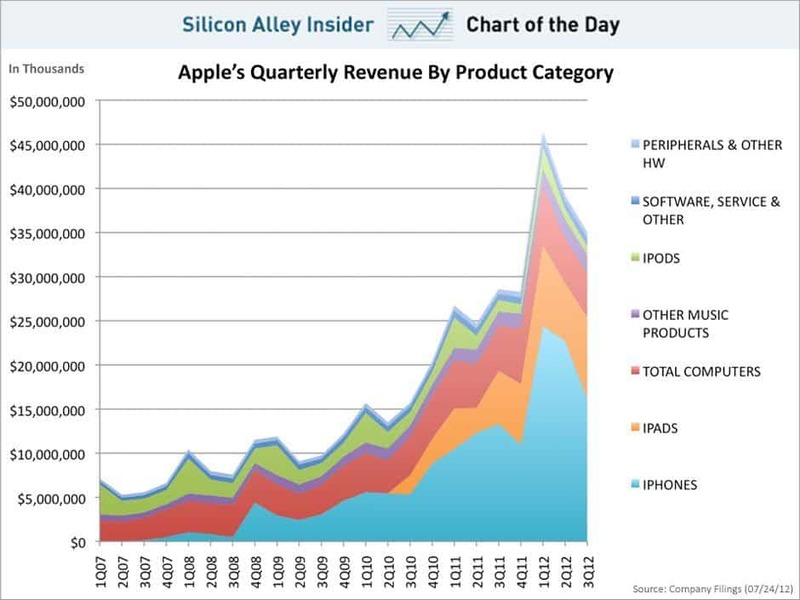 Apple increased its iPhone sales from 717.000 in Q3 2008 to 6.890.000 in Q4 2008. That’s a 861% increase. But how did they do it? Some of you might say that the reason for this was the introduction of the iPhone 3G in June 2008, which shipped with iPhone OS 2.0 (now iOS). The main reason for such a rapid increase in iPhone sales was the probably most important feature of the new iPhone OS: the legendary App Store. Much like Facebook, Apple has allowed developers to make money from the new platform. Many other companies, including Google, have done the exact same thing. They have opened up to others. Just think of iTunes, App Store, Play Store and various third-party products and services built around the two big brands. Would you buy a tablet running an OS with a poor app selection? No. Would developers invest in creating apps for this OS if they would get only a small share of app sales? No, they wouldn’t. And now you have the problem: No apps, no users. No users, no developers. So what should companies do to attract both parties? The secret to solving the chicken-and-egg problem is to subsidise one party and charge the other more. Satisfy one and the other will come. Both Apple and Google are very attractive for developers. Both get a 30% share of Play Store & App Store sales, leaving developers a solid 70%. Let’s think one step further. Now that we have satisfied one party, the other comes. Developers create amazing apps which people love to use. Hence, more people buy in. And the more people buy in, the larger the app market gets. This makes it more attractive for even more developers. And with even more developers more users will follow. By allowing one party to benefit from your platform, brands not only attract more of the other, but also create a self-sustained market within their ecosystem. All of the above sounds pretty good. But, perhaps, the most exciting thing is that open ecosystems have almost 0 financial risk. If a third-party service/product fails, the ecosystem doesn’t get affected at all. Basically, companies can charge 30% of sales without taking almost any risks. There are still some companies, which don’t embrace the “new way” of doing business. They stay closed. In June 2007 BB’s price per share was at around $240. You know what it’s now? $7.88. The stock price went up (for a bit) in January 2013 to $17.61 when BlackBerry showed off its “whopping” 70.000 third-party apps. At this point in time both iOS and Android had more than 750.000 apps in their stores. Each. As you can see, open ecosystems work and closed ones, well, they don’t. In June 2013 Twitter has announced big changes to its API. With the release of API v1.1 developers now have less freedom than before. The guidelines got much stricter and Twitter wants to control the number of users any given Twitter app can have. This move put many Twitter clients and apps out of business. Why did all of this happen? Because Twitter wants to own more of its ecosystem and push its own client apps. Time will show whether this has been a smart move in the long run. Open brand ecosystems are proven to work. Just look at the biggest technology companies out there and what they do. The ones that don’t open up to third-parties are likely to fail. There are far more benefits of opening up than disadvantages. Be greedy and lose everything. Share your success and profit from it. Cover image by Justinc. Article inspired by Marshall Van Alstyne.